We recently had the opportunity to speak with Shakta Khalsa, founder and director of Radiant Child® Yoga, and dive deeper into how she started her program and what to expect from it. She will be joining us for a retreat November 7- 11 to share her internationally-known training program for teaching yoga to children, and interacting with children consciously. There are currently around 25,000 Yoga Alliance approved Radiant Child Yoga teachers worldwide. Shakta is an ERYT-500 and IKYTA certified Kundalini Yoga teacher and is considered the “godmother” of the children’s yoga movement. She is a leading expert on children and yoga, having worked with both since the mid-1970s. My journey began more than forty years ago when I got involved in Kundalini Yoga and the Kundalini community. Members lived in spiritual communities, or ashrams, and their children lived and practiced yoga alongside them. I learned quickly that I not only really loved spending time and working with the children, but I also had a talent for it. Making up songs and animal yoga poses to share with the young ones came very naturally to me. That’s where I took my first steps teaching yoga to children back in the 70s, and I’ve been teaching yoga to adults for over 40 years as well. I worked individually with children at the start of my career before becoming a Montessori teacher. By the 1980s I had my own school in Baltimore, so I was able to do yoga every day with the students. The benefits of meditation, yoga, and breathing techniques were apparent. And I’m talking about preschoolers aged three to six. My assistant didn’t practice or study yoga, but she would beg me to do yoga with the kids because she could see what a difference it made for them. In the 1990s I moved to Virginia and became a mother – so I stopped running the Montessori school. I continued my work by teaching at various schools and daycare centers, and within a short time I was teaching five hundred children a week. 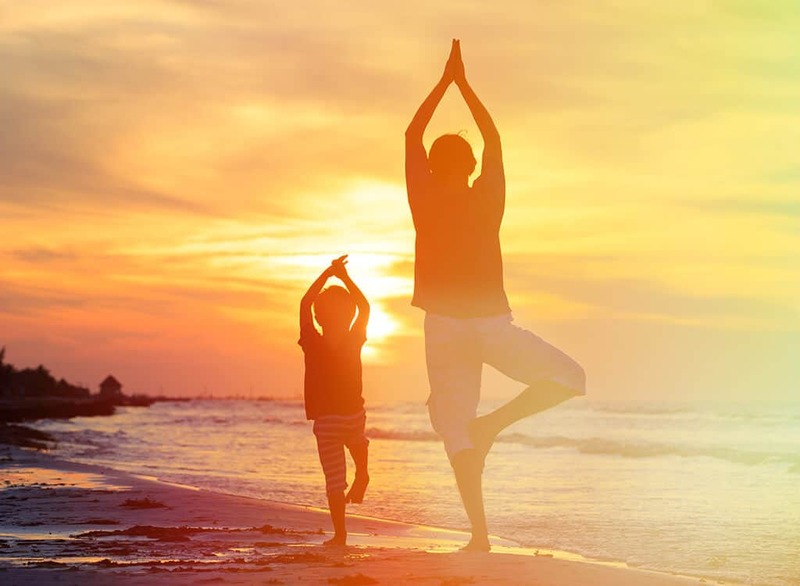 Simply put, children are impacted by yoga, breath, and meditation in much the same way as adults. They are more relaxed, focused, happier, and feel better about themselves. Maria Montessori, the founder of Montessori schools, based her teachings around the motto “follow the child”. When teaching yoga to children (or teens, because I teach a wide range of ages), we observe them to see how much energy they have on a day to day basis and tailor the practice around that. If their energy is high, we match it to help bring them back to a more calm and focused state . If they seem like they need a lift, then we use the yoga practice to provide that. The root of the motto “follow the child” is really about honoring their needs. In my program, Radiant Child Yoga, we always honor the children. We see them as big souls in little bodies. We don’t just see them as cutesy little kids; we see who’s really there. But of course, we still make it fun for them. We recognize their playfulness but at the same time we make sure to see them as fellow human beings. Children often aren’t used to adults relating to them from that space. Let’s say I’m visiting a school or after-school program to teach a yoga class. Now, the teachers are doing the best they can, and they are with them all day long, so I don’t want to cast judgement. But sometimes whoever is in charge will say things to me like “Watch out for that one and call me if he doesn’t behave. You can just send him back to me.” Immediately they’ve projected a negative image about this child. I don’t want to have an expectation about this child. I want to meet them as they are. And I’ll always point out what they’re doing well in order to help them shift their self-perspective to a positive one. If authority figures have a negative image of them, it can show quite easily and lead to low self-esteem. When this happens, they think they have to act out more just to get attention because nobody’s giving them any attention for all the things they are doing well. So I give them that, and it really helps. Spending many years working with children means I really understand them. I know how to help them live to their potential. I was the direct student of Kundalini master Yogi Bhajan during his lifetime. He would always talk about the beautiful, natural radiance of children. This is where I got the name and the mission for my program. We want to help children to stay radiant, healthy, wise, and in touch with their intuition. I started this program because I saw that children are in touch with their own inner guidance, wisdom, and joy, and I wanted to help them to maintain that. Often something happens in their lives that dulls that bright light, that radiance. I do find that children have an easier time accessing that state of original joy and connection to who they are than adults do. In this way I was so motivated and inspired by children, and I wanted to help them maintain their natural abilities and their natural connections to who they are. That’s really how this program began. To me, they’re little masters, especially the young ones. They’re so amazing, so innocent, so connected to who they are. But as life goes by, as it does for us all, children take on many things that aren’t true to who they are. They can become over-socialized, but yoga keeps them in touch with their inner light. When participants leave they have all the basic tools they need to teach children all the way from babies to teenagers. We also make sure to include teaching children with sensory integration issues like ADHD and autism. This is all done in the span of a 30 hour training. Another valuable component is the materials. I’ve written a number of books so there is plenty of information to take home, which also includes a manual, CDs and DVDs, and arts and crafts workbooks. We work with these materials during the program so you lean how to make the most of them..
Our teaching includes how to set up a class for different ages, how to use songs in a class, and how to incorporate yoga games. We introduce techniques which may be out of the ordinary, like games and songs, because they help you capture young imaginations and connect with the children. Before you know it you’re having fun, and you’re learning, too. You’re learning how to get in touch with your playful, spontaneous side. We also cover all the elements of yoga very thoroughly. It’s very balanced between teaching concepts behind yoga and letting the children have fun; for example, we add breathing practices to everything we do because I’ve found that’s one of the best ways to keep centered and avoid losing the students’ focus during transitions. It can also be very calming, which is so helpful in a classroom setting. Children have so much pure energy. I love to be around it; it’s truly inspiring. It can be a challenge, and you have to be on your toes. But in the Radiant Child training you will learn how to be on your toes and still be relaxed. It’s not about having a lesson plan and just checking off steps. You have to exhibit the inner quality of yoga, and part of the program is showing people how to do that. So, if you remember you are the yoga, your energy will emanate from you quite beautifully. A crucial part of Radiant Child Yoga is our self-awareness as adults. That’s where our own practices of yoga and meditation come in. We start our day with a Kundalini practice for adults so that we all connect with our energy, and then we can go on to learn and teach from that place of connection. By tapping into our own inner guidance, we can teach children to do the same. Learn more about Shakta’s upcoming programs at the Art of Living Retreat Center. Shakta Khalsa, ERYT-500 and IKYTA certified Kundalini Yoga teacher, is a leading expert on children and yoga, having worked with both since the mid-1970s. She is a parent, Montessori educator, and a yoga professional recognized by Yoga Journal magazine as one of the top five Kundalini Yoga teachers in the world. Shakta has authored several books: Fly Like a Butterfly: Yoga for Children, The Five Fingered Family, Kundalini Yoga, Keep It Simple Series (KISS) Guide to Yoga, Yoga for Women, and her latest book, The Yoga Way to Radiance: How to Follow your Inner Guidance and Nurture Children to do the Same. She has produced several albums and DVDs, with her Yoga in Motion DVD winning the Mom’s Choice Award. Shakta is the Founder and Director of Radiant Child® Yoga, an internationally-known training program for teaching children yoga and working with/raising children consciously. Radiant Child Yoga offers two Yoga Alliance approved teacher training schools; 95-hour and 200-hour. Through Radiant Child Yoga, Shakta has trained over 10,000 students, and has trained several RCY trainers, bringing the total of trained RCY teachers to around 25,000 worldwide. In the children’s yoga community, Shakta is considered the “godmother” of the children’s yoga movement. She lives in Sterling VA.